Just a short little update this morning to show you some progress on the miniature “Lady & Unicorn” piece that I’ve been stitching on. Nope, I haven’t abandoned it for other things – even though there are about sixty gazillion embroidery projects floating around here right now! Still, this little piece has been a pretty good carrot, so I have to keep it going! And, though the progress is slow, with literally just a few minutes here and there now and then being devoted to it – still, it’s getting somewhere! Most exciting of all – we have a head!! The tiny head on the lady’s maid is in, and it cracks me up. From afar, it looks ok – when you’re dealing with needlework that’s this small, it’s not as if you can pack in a whole lot of detail! Just to give you an idea, there’s the tip of a regular sized wooden pencil next to the gal’s little face. I really wanted to get some background in before showing her to you, but that’s another 15 minutes-or-so session down the road, I’m afraid! I’m feeling a bit like the turtle in the Turtle & Hare stories. Slow…. slow…. really slow. But – I just may get there! You know the saying “slow and steady wins the race”? I’ve never quite agreed with it. Fast and steady wins the race. But at least slow and steady finishes it… eventually! 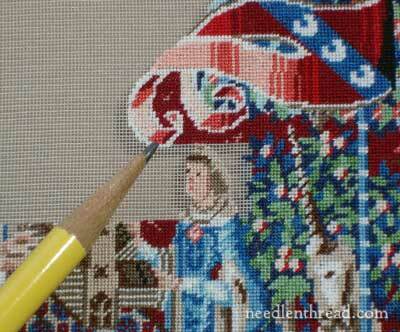 Coming along nice Mary … I love the detail on the lady’s maid’s dress and on the whole project overall. Now that she has a head, there is a person there. The banner is looking great too! Looking good! Looks like it’s going to be well worth all the effort you’ve been putting into it! I did a couple of miniature embroideries recently – not nearly so ickle as this, mine were across one thread of 48-count linen, for a pair of keyrings – and they just got finished and posted on my blog. Your work is far neater than mine, though. It is nice to see a lovely , bright miniature in progress – I have a 45″ x 35″ version of the Cluny tapestry, worked a good many years ago in my hallway – my little face is 2″ x 1 1/2″ – the colours are still a delight, but more muted after so long. Thanks for sharing yours. The colors are just so beautiful as this little tapestry fills out. Surprising to me is that there are no golden tones. Pardon if I missed this detail, but how big is the finished piece? Vicki – the finished piece is about 5″ x 5.5″. So it’s not “tiny” but it packs a lot of detail into that space! 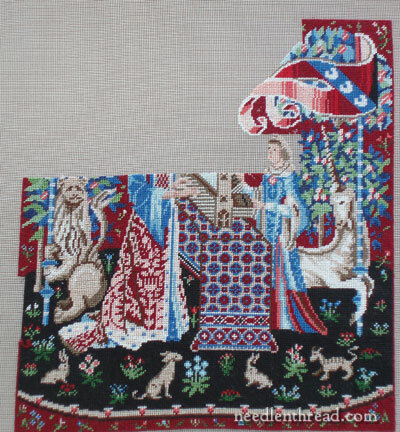 Mary-this project is my favorite one – I think it is so beautiful that it nearly brings me to tears looking at it – and I’m sure other needleworkers know what I mean by that, when a gorgeous piece is exhibited, it is breathtaking. Thank you for the pics. Wow Mary, it’s beautiful! I think you are making great progress. I hadn’t realized the scale until you posted the pencil picture. I enjoy working in small scale but I’d probably go blind on that. I can’t wait to see it when you finish. It is a cold, dreary day and I am very grateful for your blog entry today…. I do believe you are MORE than HALF finished!! Whoo Ho! Hi, Irene – I’m using a size 28 petit tapestry needle….. Since I started reading your blog daily I have been inspired to get going and get some of the bajillion projects I have started-Done!! A few years back I was doing the “if you have 15 minutes than stitch something” I was amazed at how much got done that year. But then time passes-the holidays come and go and then you kinda of forget about how you were getting stuff done and now it seems like everything is just sitting there waiting and looking at you!So thank you for your blog and I love the tiny face! What a lovely piece….it is something amazing to have when you are done. Will it be mounted and framed? What a beautiful piece! I’ve been fascinated by the original tapestry since learning of its existence in a college class about Normandy years and years ago. Sadly, I didn’t have time to go to the Cluny Museum when we were in Paris, but it’s on the top of my places to go list when (if?) we go back. Can’t wait to see your finished work!